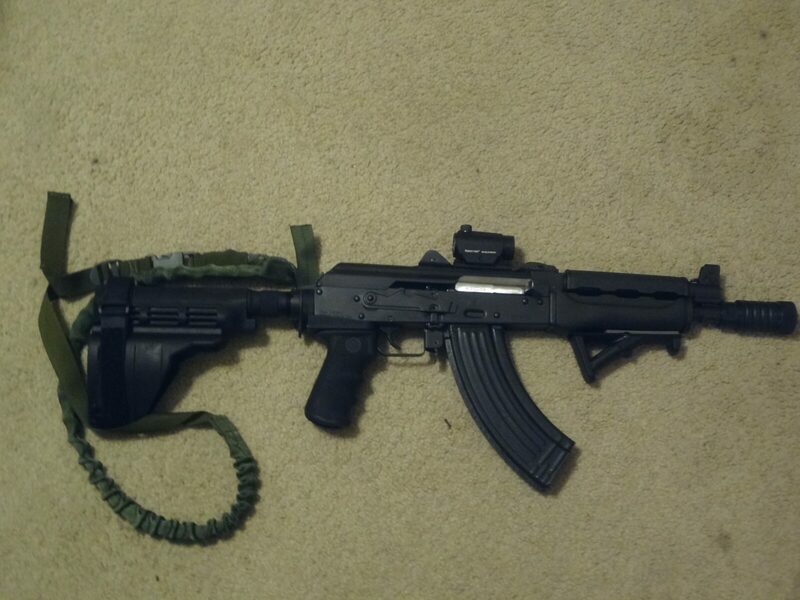 Jef’s Zastava M92 PAP with our dark olive drab handguards and a quick release pin to remove the receiver’s dust cover. 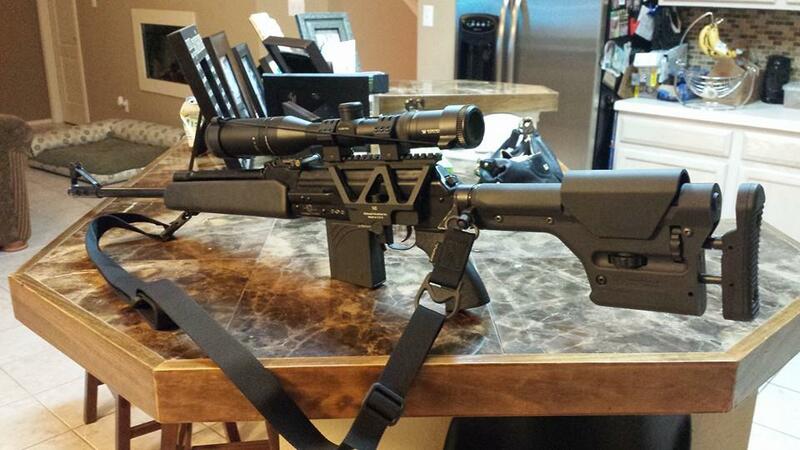 He’s running our Vepr handguard on his .308 Vepr. Looks very sweet! I think this color combo looks great on his rifle. 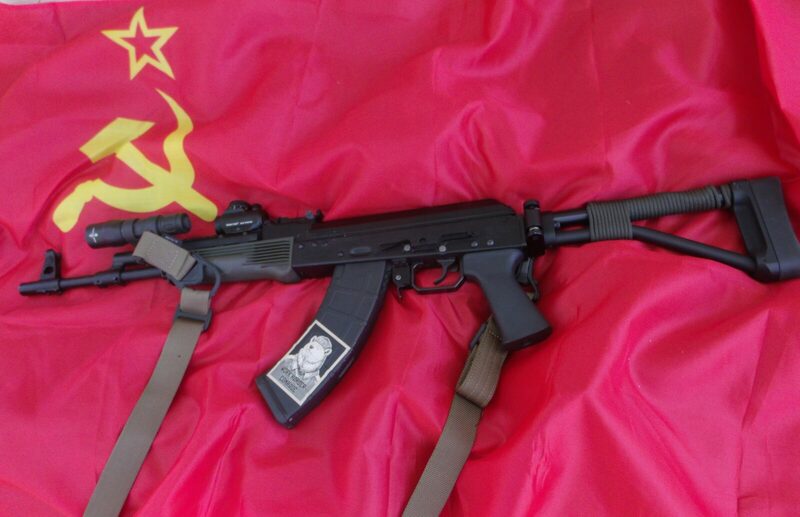 He went with a black First Generation Molot grip. 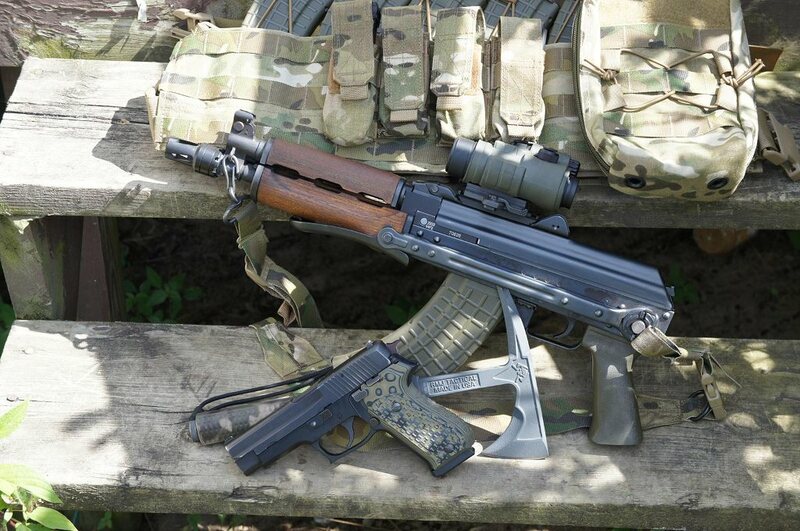 That sure is a sweet M92 SBR. 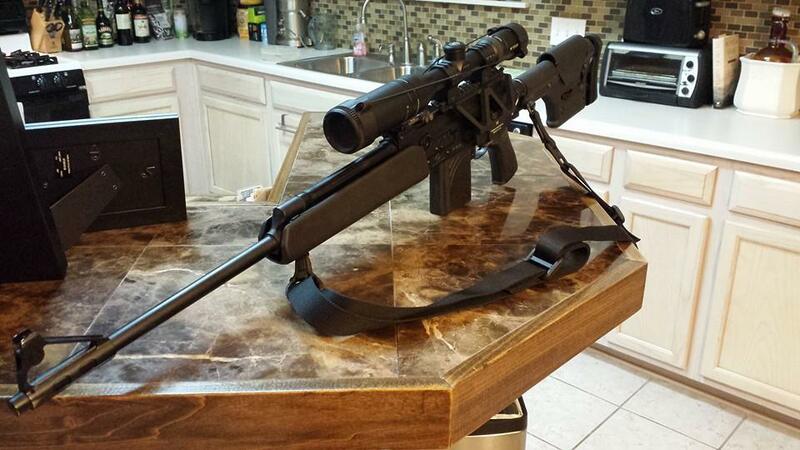 It is using one of our First Generation Molot grips on it. Looks like a cool color combination. 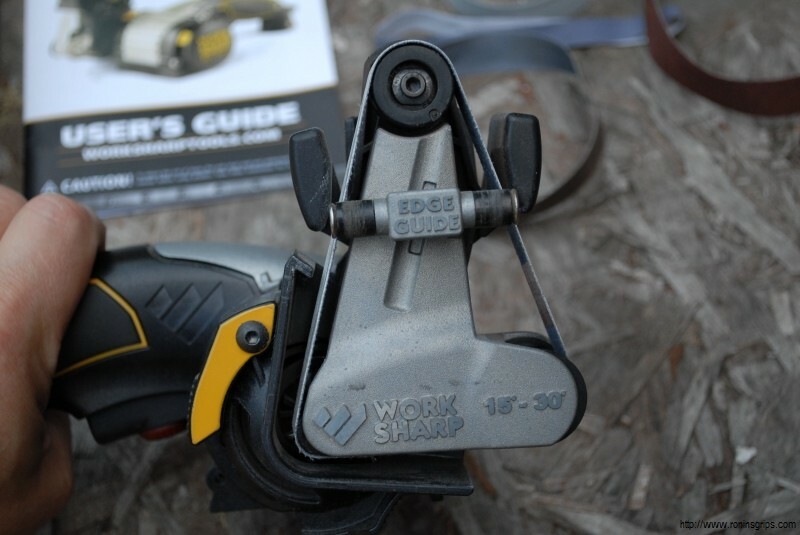 Guys, one of the sharpeners I use a lot for touch up of smaller blades (not the khukuris) is the Spyderco Tri-Angle Sharpmaker. The unit is as simple as can be – the brass rods are to protect your hand and then it comes with two pairs of stones – fine and medium basically. You put the stones in the angle of your choice and the hold your knife straight vertically as you run the blade down the stone. 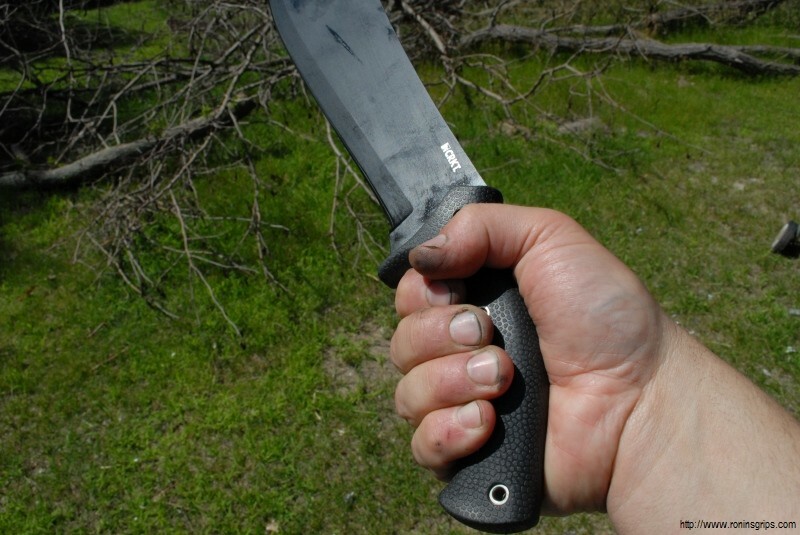 The unit works really well for maintaining pocket knives and blades that are ballpark 5-8″ – much longer and it just really gets tedious. Now I don’t use the medium grit brown colored traingles much. I use the fine and the optional Ultra-Fine triangles for most of my maintenance. The Ultra-Fine stones (ceramic really) can put a hair popping razor edge on blades. One thing to bear in mind if you you want the ultra fine stones is that Spyderco sells them by the stone – why? I have no idea and think it is confusing – you really need two. 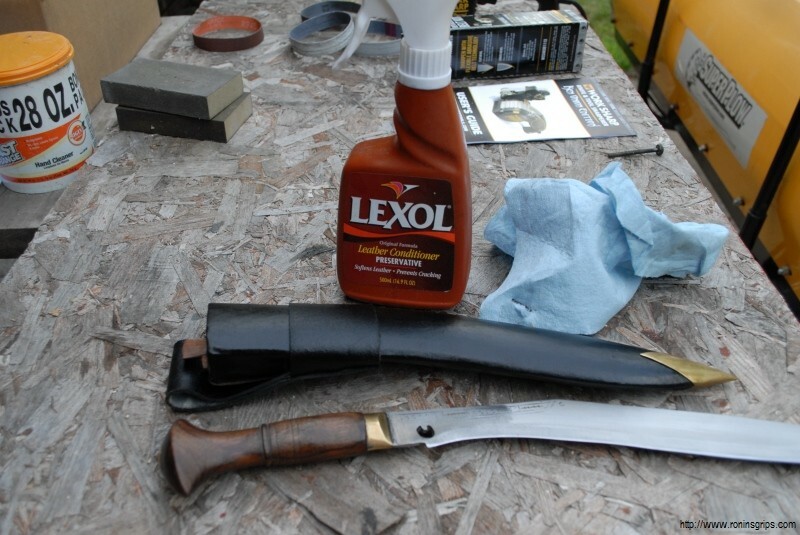 I get asked how to moisturize leather sheaths regularly. Up until now, my go to solution was either Mink Oil or Neatsfoot oil that I would rub in by hand. The idea is that the heat and pressure of your hand helps the oils to get worked into the leather. This has worked fine for me for years. I was recently recommended to try “Lexol Leather Conditioner” and have been doing so for about a month. 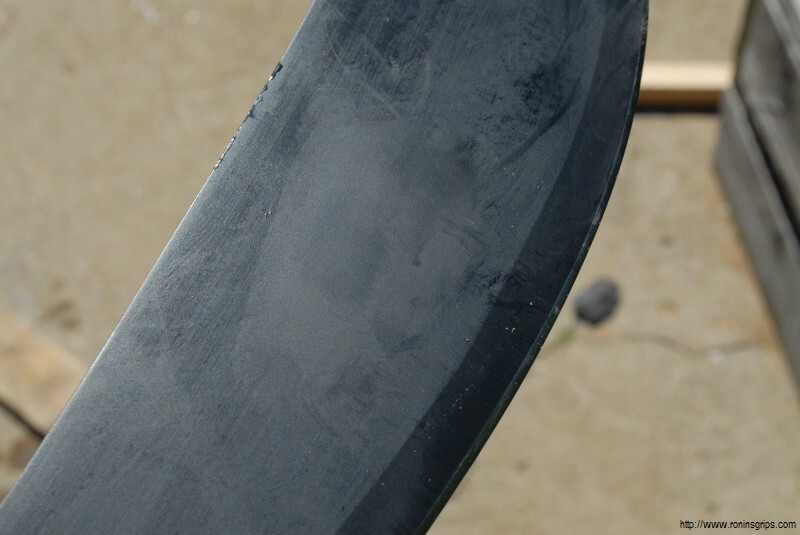 The following photos if of a khukuri sheath that was very dry. I applied the Lexol, still rubbed it in my hand, and then buffed off the residue. It seems to have done a very good job. 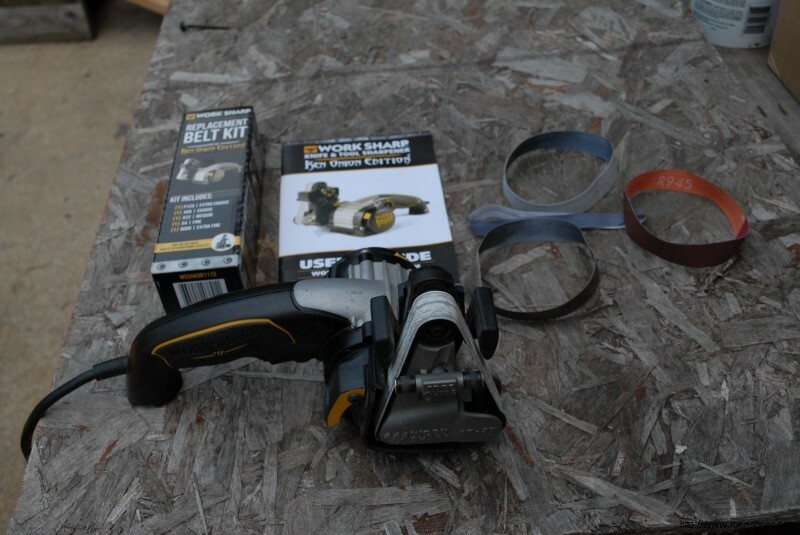 I have done a number of items now including work boots and the Lexol seems to work. I have been rubbing in two passes – not just one. I grew up working on boots, gloves and saddles. If something was dirty, I would use saddle soap but more often focused on conditioning. It’s amazing what a little care can do to old leather. One tip – I like the paste mink oil and use a hair dryer to help melt the paste into the leather of boots. It does a great job sealing them up but it definitely darkens the leather but boy are they supple and waterproof afterwards. I have a thing for machetes. Why, I do not know. Over the years I have owned quite a few and have a number of them in my garage from various manufacturers and blade profiles. 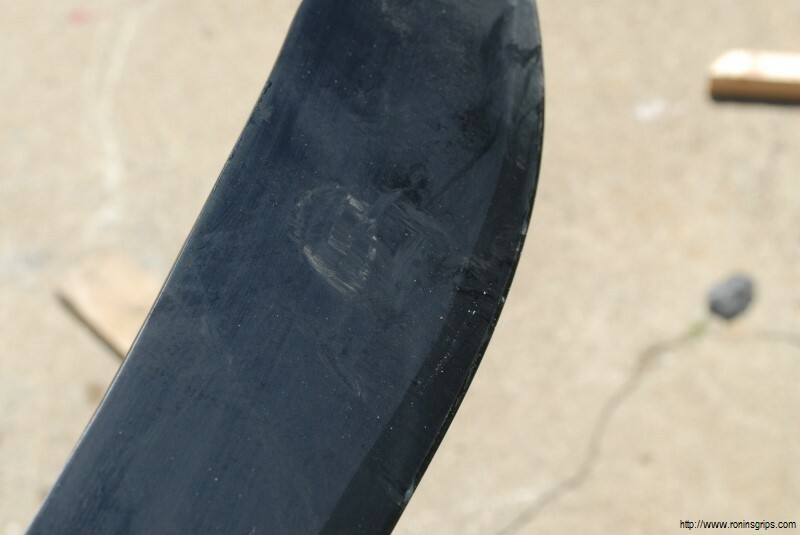 I am accumulating chronic injuries almost as fast as I am blades it seems. I have two torn rotator cuffs, tendonitis in my elbows and carpal tunnel in both hands after years of abuse. 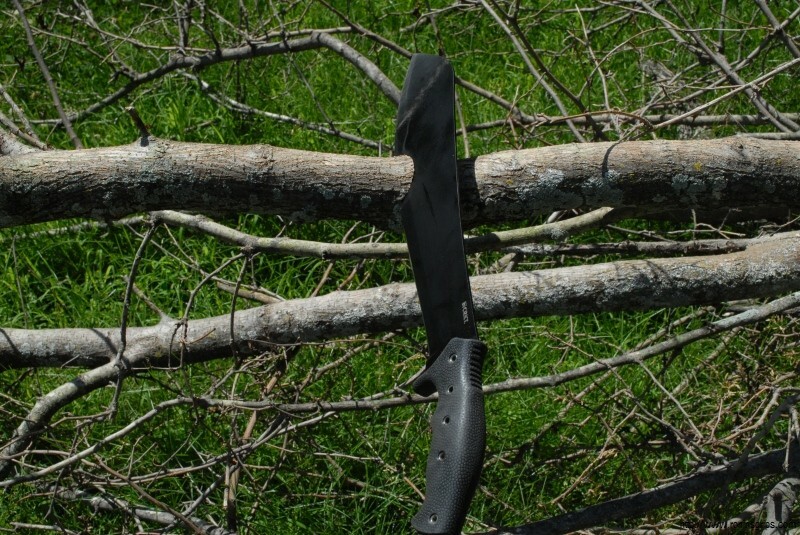 Luckily, I can swing a machete albeit slower than I used to and trying to hold on to the handle plus the impacts usually combine to make my hands stiff and wrists ache. 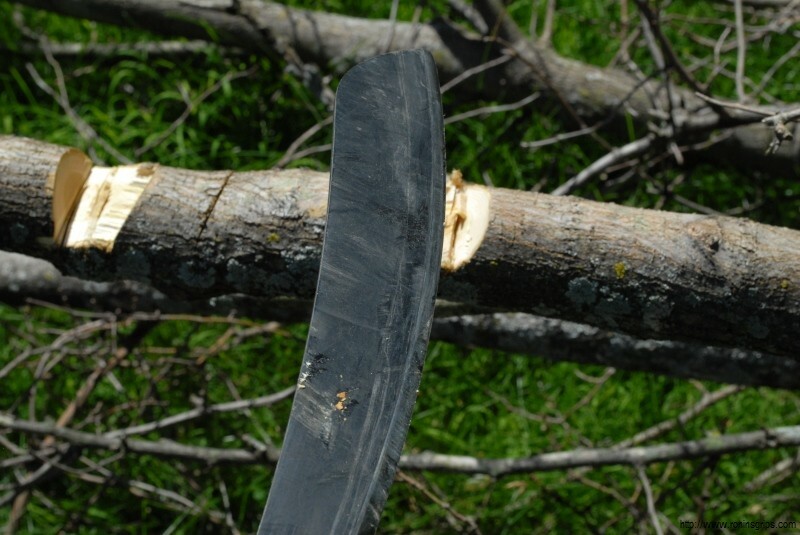 Let’s face it – machete handle design hasn’t changed much in decades. Now, I like Ken Onion as a knife designer. 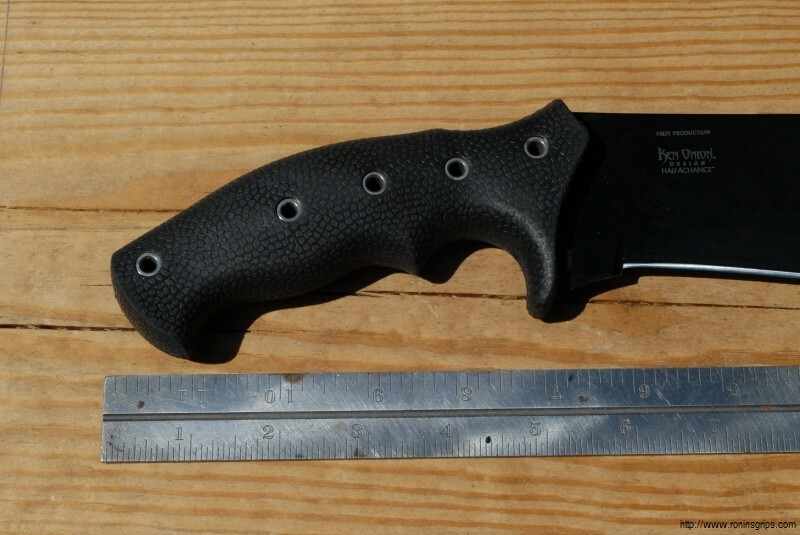 I read about his new HalfAChance Parang-style machete (CRKT # K920KKP) and that it had an ergonomic handle. This intrigued me. I was first in line to buy his big Redemption knife but while he had the basic shape right, the handle was too small for such a big blade so I sold it. That didn’t turn me off to his designs though – I probably own at least six Ken Onion designs so I know he knows his stuff. At any rate, I went ahead and ordered one of the HalfAChance machetes from Amazon and two days later the box arrived. 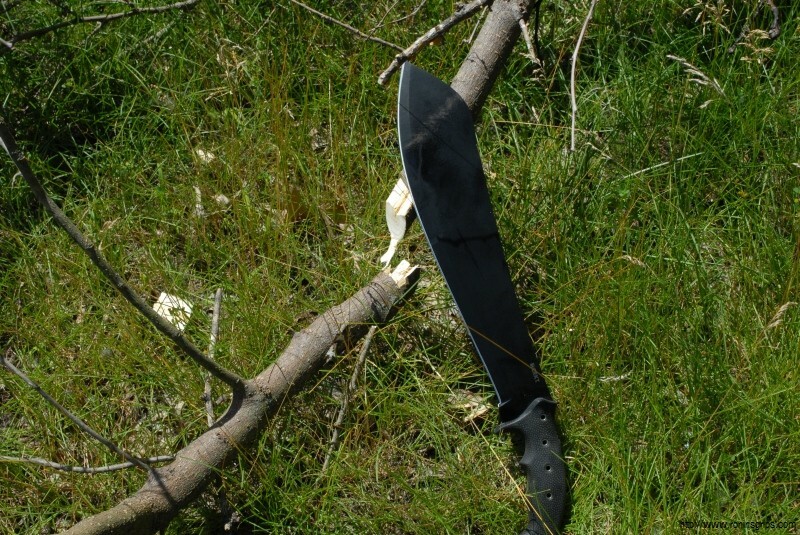 I opened it and there sat the big machete in an even bigger nice Nylon sheath but I immediately looked at the handle – it was big and had a textured rubber over some solid core. I picked it up and it felt great! Notice the natural angle to the handle. I wear XL sized gloves and you can see the handle fits my hand nicely. The first photo is of it in my left hand and the second photo is of it in my right hand. The overmolded rubber feels great. By the way, I also noticed they did a great job on the finish. It is a powder coat over a bead blast and despite the chopping, it was in great shape. I saw some dirt and it rubbed right off. It held up a lot better than I expected – no sign of flaking. After testing the HalfAChance for a bit, I was interested in comparing the CRKT Parang to my Condor Parang. 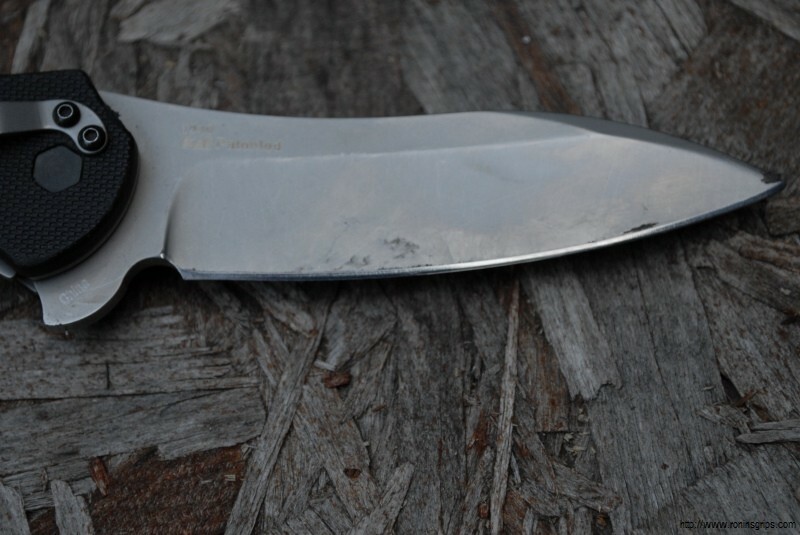 The Condor is very well made and has a nice curved handle. 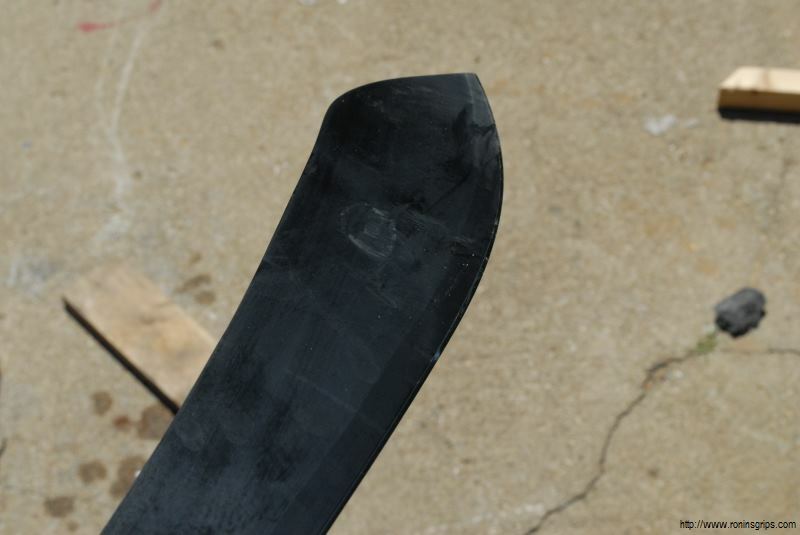 It’s blade was dull so I took the time to put a nice working edge on it first. I also took a 15 minute break to make sure my hand wasn’t unduly stressed to be fair to the Condor. 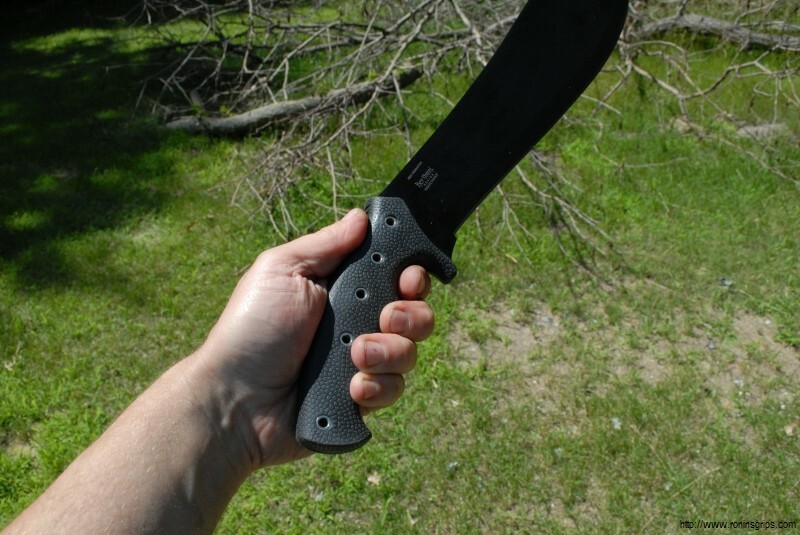 So, to me, the winner and new go-to machete it the CRKT Parang hands down. It cuts and feels great. CRKT and Ken Onion did a great job on this one. 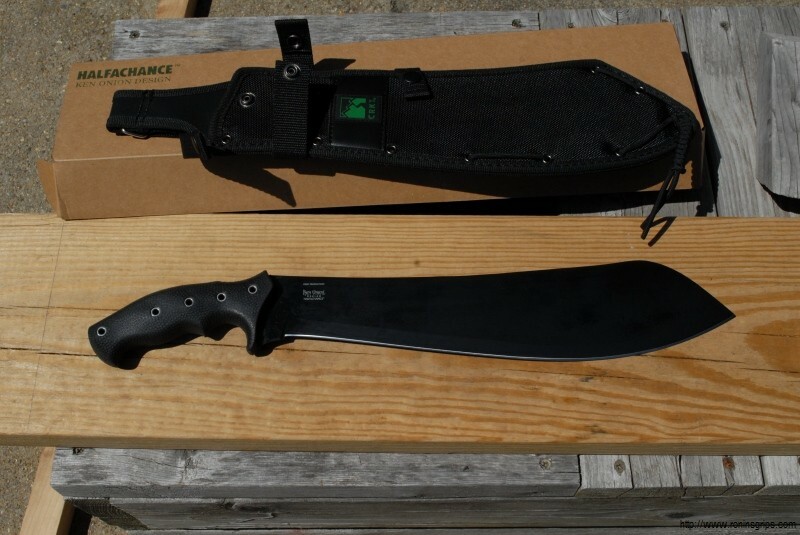 Of course, I will have to now order and try the other machete they released, the ChanceInHell! October 2017 Update – took this on our annual brush clearing trip just before Halloween on property we own and it worked great as usual. 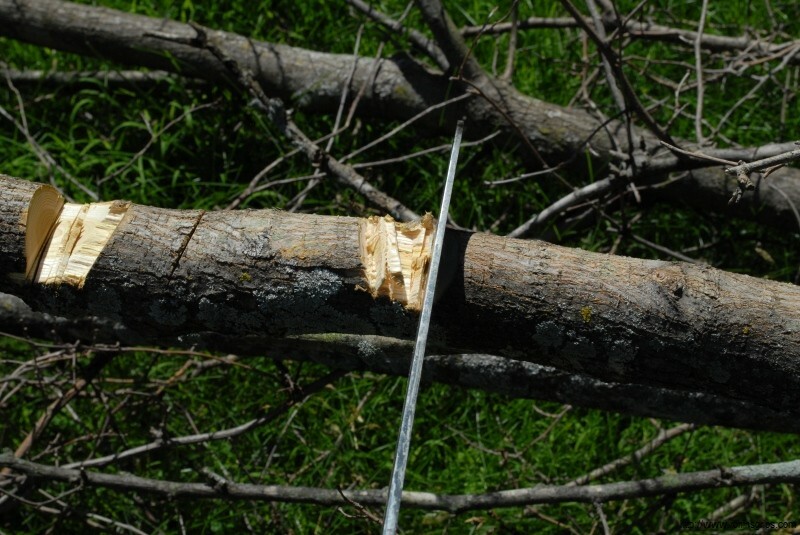 After dozens and dozens of branches, saplings and briars, it is still holding up great. 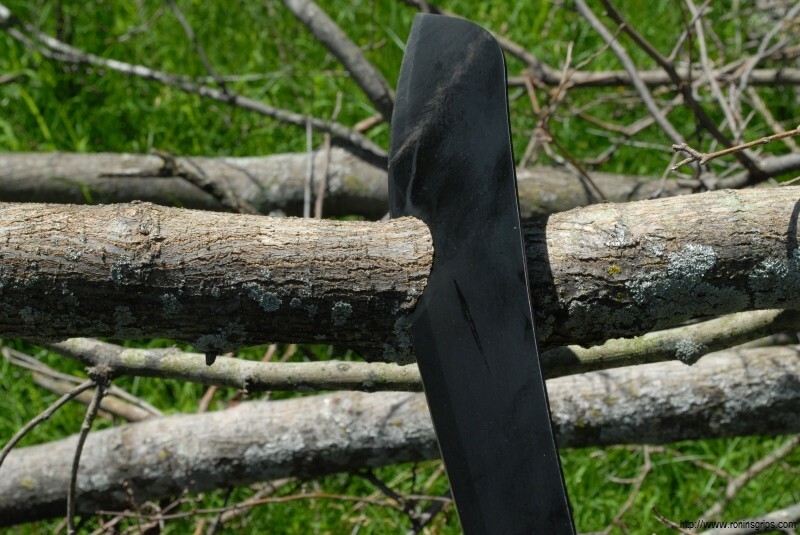 It is still my preferred machete and use it probably 3-4x per season. 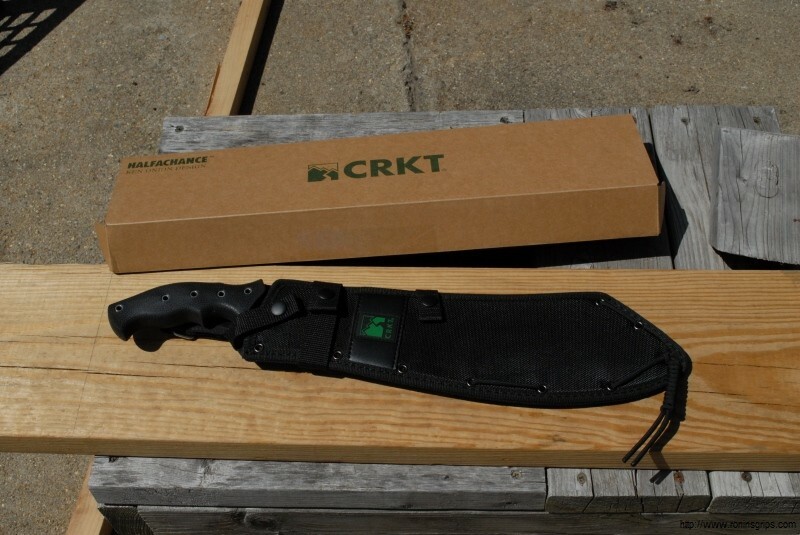 Columbia River Knife and Tool CRKT M16-01S Knife - Usually ships in 12 hours!!! CRKT COLUMBIA RIVER KNIFE & TOOL CROSSBONES 7530 FOLDING KNIFE. We will have a future post about cleaning and maintenance so keep an eye out for it.